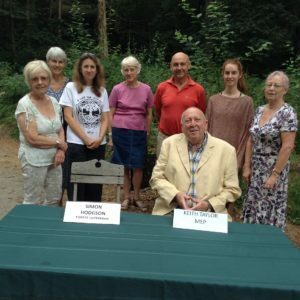 Green MEP Keith Taylor joined local campaigners at the Leith Hill proposed oil drill site to call for Forest Enterprise to start discussions about giving up leasing the land to an oil company. Keith Taylor had invited Simon Hodgson, chief executive of Forest Enterprise and the Forestry Commission (1), to discuss offering the lease to A Voice for Leith Hill (2), rather than Europa Oil and Gas. The lease runs out in September. He was represented at the meeting by an empty chair. Keith Taylor said: “People have the right to question why a public body with explicit environmental and climate change commitments continues to engage in a commercial partnership to allow climate-destructive drilling in the Surrey Hills Area of Outstanding Natural Beauty. Pat Smith from A Voice for Leith Hill said: “It’s devastating for the local community that the Forestry Commission keeps renewing this lease for oil drilling which will have huge environmental impacts. We’ve proposed raising funds to take on the lease when it runs out, but the Forestry body won’t even come and talk to us about using the site for a much better community purpose”. Forest Enterprise England is the executive agency of the Forestry Commission (FC) that manages the nation’s forest estate for the UK government.